As New Jersey’s science, technology and design university, New Jersey Institute of Technology is at the forefront of innovation, excellence, and entrepreneurship. For more than a century NJIT has led the way in educating the leaders and innovators who shape industry and create new technologies. NJIT is building tomorrow’s university today to ensure our future leaders are taught by leading academicians utilizing the latest technology. 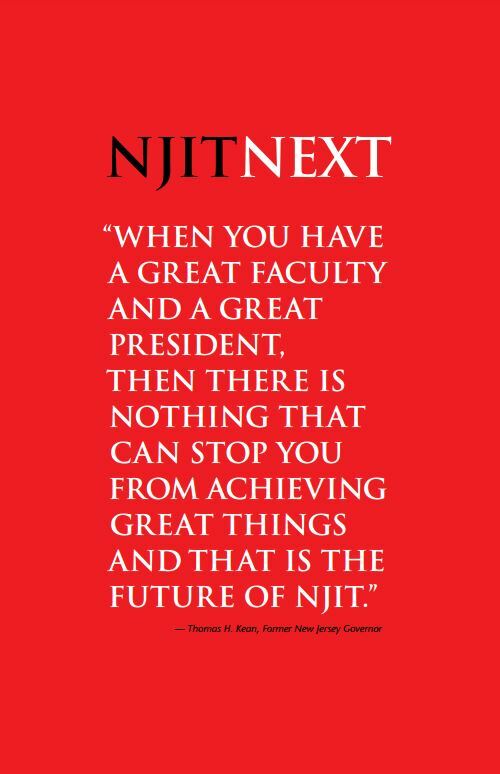 The NJITNEXT campaign is an opportunity to keep that promise to the next generation of students and invest in the future of a great university. At no other time in our history has strengthening skills in science, technology and design been more critical. And at no other time has financial assistance for deserving students been more important. NJITNEXT, the university’s most ambitious campaign to date, is fulfilling its promise. Now, we need to finish what we started. For further information on the campaign, please contact the: Campaign Office, campaignoffice@njit.edu, 973-596-3400.